I'm not trying to offend anyone with the title of this picture. And please ignore the far from spectacular imagery. It's just that I remember one-time reading and/or hearing somewhere along the lines that inline skating was a fast-fading sport, at least on a general fitness level around home. And to be honest, I even believed it for a time too. Roller skates were back for roller derby. The summer inline rink at North Avenue Beach wasn't as hopping as I remembered it in years past (or I was missing the action). And the Lakefront skaters that made me cringe at my decision to take my bike or my running legs onto to the path when the leisure users were already out and about--causing me to swerve around the skating legs that left me thinking I could get kicked at any unexpected moment. Instead I'd see them cruising at night, in the dark, late evening hours when the police cars and random wanderers cruise the path more frequently than the runners and cyclists. But today's Mad Dash to Madison race, a 10K skate and 5K run, definitely pushed those extinction thoughts out of my mind. Especially after I woke up and realized the inline skate at a hockey-focused race made total sense: ice skating, inline skating, inline skaters like Chad Hedrick picking up speed skating to win Olympic gold. 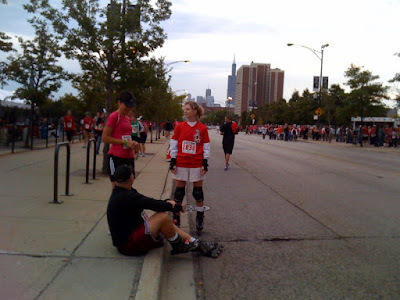 And there were plenty of Chicagoans lacing up their skates for the 10K. Those donning full-on uniforms for Team Rainbo and other teams who made the skating look easy and fast (something I could never do), leisure skaters like those pictured above, and others who looked like they hadn't worn inline skates in a long time--or ever. Even so, it was finally a race where the skates were welcomed and not banned, and with relatively smooth roads to skate on, too.